I started a new quilt, though it’s not a happy one. The week after the attack at the night club in Orlando, I was sitting at my machine, sewing the very pretty blue and white quilt for my bedroom and thinking about the news. I found myself just heart sick thinking about how epidemic the mass shootings seem to have become in the U.S. and an idea for a quilt, a “protest quilt,” as I am calling it, floated down into my head, fully-formed. But, I knew it wasn’t going to be an easy project emotionally so I actually looked up at the sky and said to the Muse, “Really?” and like a petulant child, “Do I have to?” I sighed and took it on. The quilt will have one block with the name of each victim of a mass shooting in the United States during the last 20 years. When I started doing research and realized just how many people that was, I added the parameter that I would only cover attacks with ten or more victims, which unfortunately means not including the recent Charleston church attack, but still means about 186 blocks. Yes, that’s right, 186 people have died in mass shootings with more than 10 victims during the last 20 years. The blocks will be representative of the state flag of the state in which the attacks occurred. 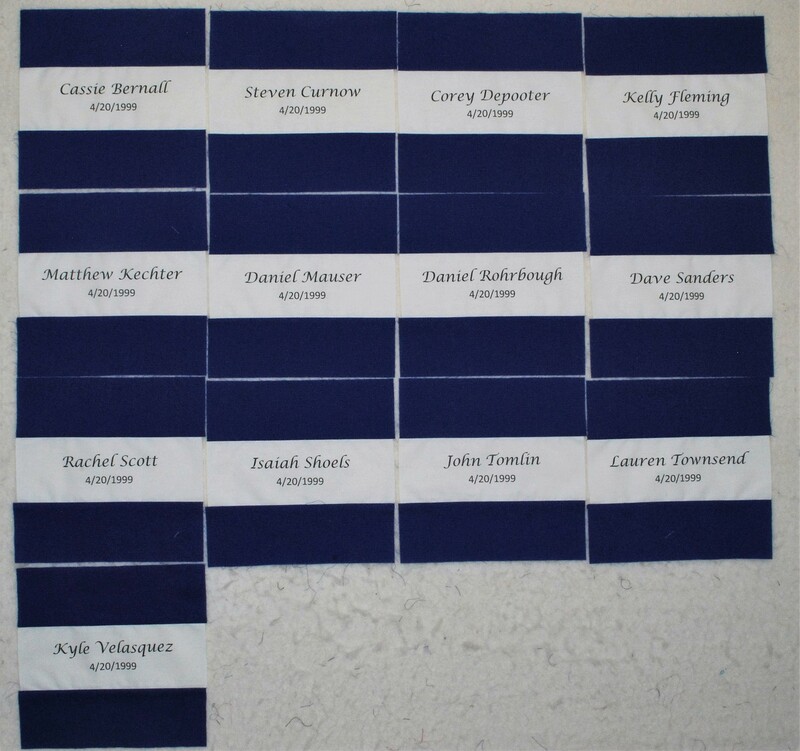 Here’s the first set of blocks, memorializing the victims of the Columbine School shooting in Colorado in 1999. Next PostCreative Play Newsletter Vol. 2 Coming Soon!